Jackson County is home to the final stretch of the Blue Ridge Parkway - more than 40 miles of uncrowded scenic beauty. Gaze in wonderment as you enter the county amidst 6,000-foot peaks of the Balsam Mountains, and make sure to stop at the Richland Balsam overlook. With an elevation of 6,053 feet, it is the highest point on the Blue Ridge Parkway. Excellent hiking is found all along our Jackson County stretch of the Parkway. One must-see hike begins at milepost 431 - a 1.5-mile loop to the 6,410-foot summit of Richland Balsam, among the loftiest mountains east of the Mississippi. 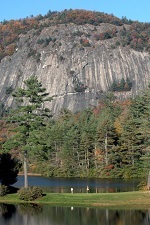 Other noteworthy hikes originating from the Parkway include: a short, easy hike to a mile-high meadow at Wet Camp Gap (milepost 427), and a 2.4-mile (roundtrip) fairly steep hike to the 6,292-foot peak of Waterrock Knob (milepost 450). Waterrock Knob provides extraordinary views of the Great Smoky Mountains. As America's Favorite Drive pushes toward its terminus in the northern part of Jackson County, motorists and cyclists soak in the undisturbed beauty of the Great Smokies. Here, along this particulary peaceful stretch, the Parkway parallels the Mountains to Sea Trail, one of the great hiking initiatives in North Carolina. The Parkway reaches its 469th (and last) milepost at the Great Smoky Mountains Visitors Center and Mountain Farm Museum, just outside Cherokee. For more info on things to see and do along the Blue Ridge Parkway in Jackson County, call the visitors center at (800) 962-1911.